The interior is not what I expected and I think my jaw literally dropped. The Russian Orthodox Church in Nice is the largest Russian Orthodox cathedral in Western Europe. The cathedral was opened in 1912, thanks to the support of Russia’s Tsar Nicholas II. The exterior is spectacular but it’s the inside that is truly majestic. The interior contains a vast collection of decorative woodwork, icons and historical items moved from Russia to Nice during the Russian Civil War. Get superb photos of Nice from La Colline de Château (also called Castle Hill) which can be accessed through Old Town via Montée du Château. There is no castle here though! It was destroyed in 1706 leaving behind ruins. Stop by to admire the cemetary, Cimetière Israelite, on your walk up. This Jewish cemetery & Holocaust memorial is a lovely spot to visit. You could also take the staircase or elevator (Ascenseurs) on Montée Lesage. Either route you choose, visit the waterfall, château ruins and park. Being the highest altitude in Vieux Nice, it’s the perfect spot for Panoramic views of the Port, Promenade des Anglais and Baie des Anges. Walk down the Port side to see the colorful fishing boats, Pointus. Walk around to the opposite side of the port and possibly stop for coffee at Club Nautique while watching the sailboats head out to sea. Or continue down (possibly taking bus 38) to Coco Beach. On your way back toward the Old Town, pay your respects at the Monument aux Morts, which honors the Nice citizens killed during WWI. On the eastern side of Old Town you’ll find Place Garibaldi. Admire the 18th century Baroque architecture and see the Giuseppe Garibaldi Fountain. Garibaldi was responsible for unifying Italy in the late 19th century. He is called the “Hero of Two Worlds” because of his military enterprises in Brazil, Uruguay and Europe. And interestingly, received financial and military support from the United States. If you’re looking for a sweet treat, stop into Patisserie Cappa. The Café de la place is also a good place to stop for a coffee and has good Wifi. Next to the square, you can access MAMAC or Le Musée d’Art Moderne et d’Art Contemporain. This contemporary art museum with changing exhibitions has a great rooftop terrace. A great spot to see the beautiful Mediterranean Sea is along the Promenade des Anglais. Rent full-size bikes all along the Promenade from Vélo Bleu or just stroll along and enjoy the atmosphere. We spend many evening outside as the kids ride up and down the Promenade. I’d suggest walking all the way down to Le Negresco, stopping to enjoy the sites. While you’re down that way, consider a visit to the Massena Museum as well. If you’re looking to walk off some of that fabulous Niçiose cuisine, a hike up to Parc forestier du Mont-Boron should be on your list. You could take the bus if you’re short on time or energy. I’d suggest walking down to Villefrenche-Sur-Mer on the other side of the mountain. You can always take bus 100 or 81 back to Nice. See more about what to do at Mont-Born and why you want to enjoy these spectacular views. Another idea during your visit, is to spend a few hours or even a full day in Cimiez. Stop by the Musée Marc Chagall on your way to see the biblical works of Marc Chagall. It’s a fairly small museum, so it shouldn’t take long. After walking around the olive grove and visiting the Franciscan Monastery & Italian-inspired gardens (free), see the Musée Matisse to examine works by another famous artist that made his home along the Cote d’Azur. You can admire paintings and drawings as well as see furnishings, curtains and vases belonging to Matisse. We’d also suggest the Musée d’Archéologie site de Cimiez et de Terra Amata which is the site of the ancient Roman Baths in the city once called Cemenelum. The site includes locker rooms (men and women shared the same locker room), toilets, swimming pools, hot and cold baths, a political bath (where men discussed politics), market, cemetery, cathedral and more. The piping system is quite elaborate and interesting to see as well. We also stood on the old road made of Limestone, still intact after thousands of years! Make sure to walk through the Roman amphitheater – yep, there were gladiators here too. This is one of the smaller Roman amphitheaters holding 5,000 spectators. Read about everything there is to see in Cimiez. Take bus 15 if you want to visit the Chagall museum first, otherwise take bus 15 or 17 to head toward the Monastery and Matisse Museum. Last but not least, the beach. If you’re lucky enough to visit during the warmer months, you could plan an entire beach day on the shore. Even if the weather is cool, plan to spent time relaxing by the water. The ever changing blue waters are a treat regardless of the season. Even better – grab a bottle of rosé and a pizza and enjoy dinner watching the sun set over the Baie des Anges (which translates to Angel’s Bay). Traveler’s note: Consider purchasing a 48 hour ticket, 7 day ticket or the French Riviera Pass to save money visiting the museums around Nice. Kids under 18 are FREE. What are your top things to do in Nice, France? I am thinking to spend three weeks in Nice end of December and beginning of January. Is it a good idea to Go there in winter while it’s festive and new year time? Yes, Nice is lovely this time of year Rita. The Christmas Markets in Nice and Monaco go through Jan 1st. You’ll find the surrounding villages light up with other smaller Christmas Markets to also see this time of year. The weather will be a bit chilly, so pack accordingly. Though, not a cold as Northern France. We are off for our annual holiday to Nice for the month of August. Are you still in France? Unfortunately no, we actually leave tomorrow. It’s great you come every year. Karen and I rent out cottages (gites) in the Dordogne during the Summer and then take a break at the end of the season somewhere in France. We’ve just returned from Nice. Wonderful and highly recommended as is your website. I wished I’d read it before we left. Informative and spot on. Good stuff – Thankyou. Thank you! I’m glad you enjoyed your time in Nice! I’d love to visit the St Nicholas Orthodox Cathedral, and of course the beaches! I’ve been to Paris twice now, but never ventured outside of that. I definitely need to go back to France! Thank you for all of the wonderful suggestions! St Nicholas Orthodox Cathedral is stunning and, of course, you can’t miss the beaches. Next time you plan to visit Paris, you’ll have to pop down to Nice. I’m so glad to bring back memories of your visit! 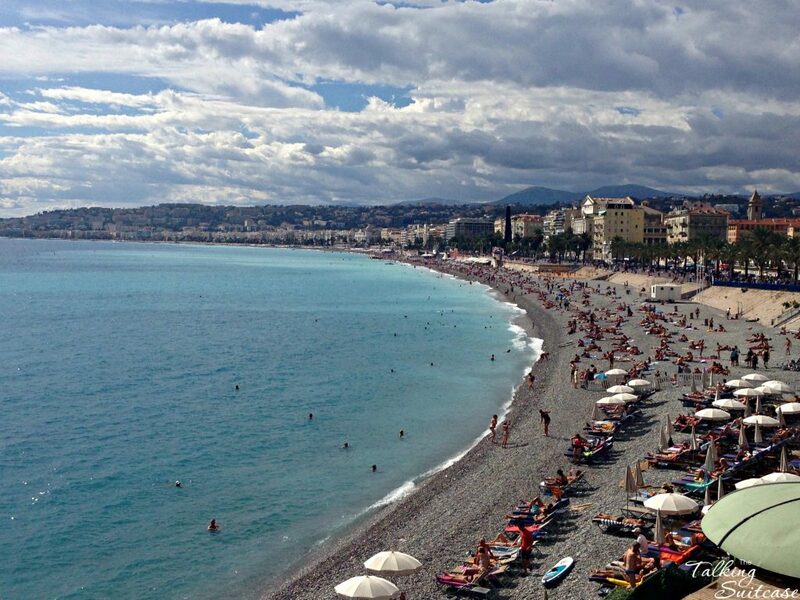 I’ve always wanted to visit Nice–we’ve been to France a couple of times, but have yet to make it to Nice! The beaches look amazing and the views from Castle Hill look gorgeous. I’d love to check out some of the museums you mentioned as well, especially Musée d’Archéologie site de Cimiez et de Terra Amata! The Musée d’Archéologie site de Cimiez is great. It’s festinating how the Romans were everywhere, even Nice. Let us know when you plan to visit. A great summary of the options. It makes it so much easier to narrow it down when time is limited. I’m a big fan of the historic sights and architecture so they would be high on my list. You’ll find historical architecture all over Nice. My building is from the 1700’s. You can see the dates over the doorways of most buildings and of course plenty of old churches to admire. The scenery is amazing and the old town looks so charming. Nice looks like it has a great balance between history and nature. It looks like there are so many things to do you’d need a couple of weeks to really explore Nice. Yes, there is a fantastic opportunity for both city and nature. The sea on one side of the city and the mountains on the other. In the winter, you can even go skiing about an hour and a half away. Nice looks like an amazing place to explore! We recently moved to France, so I’ll be keeping this handy for when we finally make it to the South. I love visiting historic sites, so there’s plenty on this itinerary to keep me busy! Where in France did you move? There are so many cities we still need to explore. Nice has a possibility of such a lot of wonderful activities. The shoreline is amazing, but it will be the historical places I will be visiting first if I get there any day. Nice has an interesting history. It was once part of Italy and they even have their own Niçoise language. We loved our time in Nice! Probably one of my favorite destinations in France – we spent a week and did many of your suggested activities, as well as many day trips – it’s a great base for day trips! There is lots to do in Nice, but the ease of taking day trips is one of my favorite things about the city. Hop a bus to a quant French hillside village or jump the train to Monaco or Italy. So many places to visit less than 2 hours away. Hadn’t thought about the museums of Nice and Chagall is a favorite artist! Nice place to walk too. Inspiring thoughts of my early days wandering France. If Chagall is your favorite artist then a visit to the museum is a must!